I love to try to get organised in everything I do but I'm not saying I always manage it completely. My iPad is like my diary, filo fax, novel, organiser, all rolled into one and a lot more. It goes everywhere with me and when I'm at the computer it is sitting beside it. There are certain apps which just have to be on the first screen of the iPad and on the dock at the bottom so that I can easily open them quickly. These would include what I consider to be the 5 best organising apps I have. Of course if you know me any way well you will know that I like free things and all but one of these 5 apps are free. These 5 apps keep my everyday organised, just exactly as I want it. They have a phrase "Love your email again". This is exactly what happened - I did fall in love with dealing with my emails again. You really have a look at this because it has a Smart box thing for sorting out your emails as they arrive but also it senses where you will probably want to file your emails and it just looks good. Great for short notes, lists, messages, I use it regularly. So easy to slip in and out for quick note and easy to add photo. My husband and I use it for those things we need to remind each other about "buying on the way home" or things we need to "find a day to do around the house" etc. plus keep short notes for easy access later. Syncs great to android phone and sharing with other people and you can colour code everything. My favourite place to download files and Pdfs to. Quick and easy to find and open and read through my files again. I can move files around easily and it can deal with pictures too. I no longer use the scanner on my printer this is just far handier, in fact I haven't even bothered to link up my new laptop to scanning software for my printer. If is called a PDF scanner but you have the option to save as a picture too. Printing from it and sharing from it are simple. I use it every day, and in so many different ways. It's a ToDo app plus so much more. You can organise everything with this app, make all your lists, have deadlines, make projects, decide when to start work on something and check things off, have repeating todos plus have notes on your todos plus more and more. 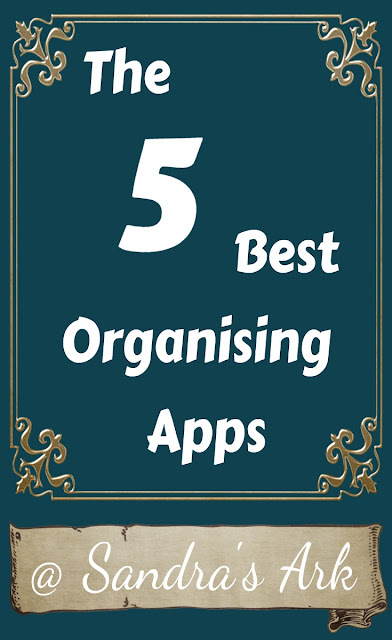 Are you looking for the 5 best organising apps for every part of your life? 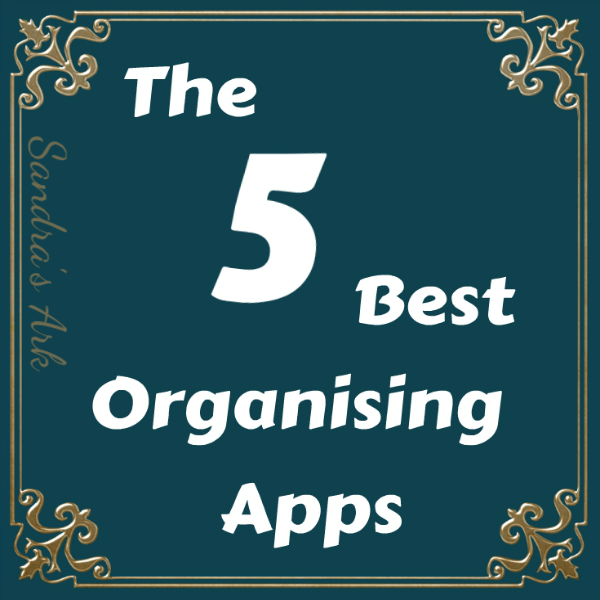 I have choice between them all and within each one so to me they are ideal for all I want to do and not hard to learn to use - definitely the 5 best organising apps for me! Thanks for the list! I've been looking for a better document scanner app. I haven't heard of any of these apps, but I could definitely use some help organizing! I've pinned so I can come back and choose some to try. Goodness! It's time for me to join the party in the 21st century! Love organization! Thank you for sharing. These are great apps! Thanks for doing all this work! Thanks for sharing... 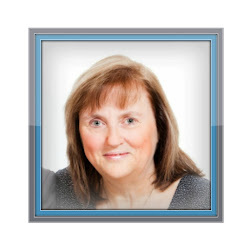 I hadn't heard of these, and it's always fun to learn about new apps! Oooh, when I have a bit more time I'll come back to your post and really study it! I could use a mail organizer. Definitely sharing this, thanks! These sounds great! I honestly had never heard of any of them and while I do try to be hyper organized I KNOW some of these would be a huge help. Thanks so much for sharing with us at Love to Learn; Pinned. These sound like great apps. I see at least a couple I'll check out. Thanks for sharing. These look like great apps. I'll have to check a few of them out. So awesome! I love being organized so this is perfect!! I don't have a lot of apps on my phone but these sound really helpful! How awesome! I never even though to look up apps for this! This is awesome. I have a very hard time with organization and never know where to start. This helps tremendously as I am getting to a point where I need to take multiple sources and put them in one place (Google Keep & Thinks 3)!